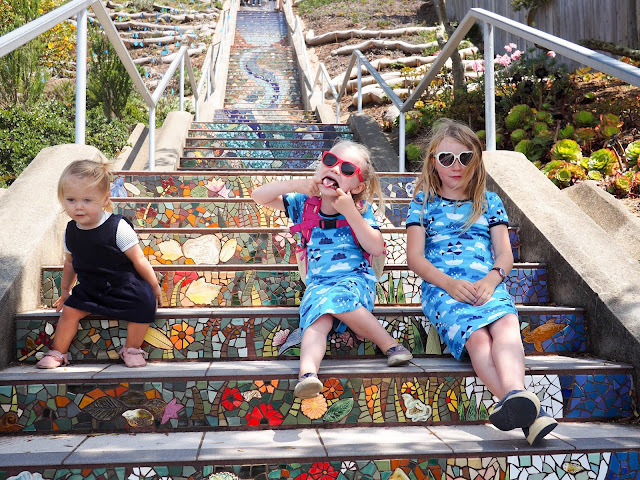 Back in August I shared a beautiful location in San Francisco that the girls and I stumbled upon by mistake: the Hidden Garden Steps (which you can see here). 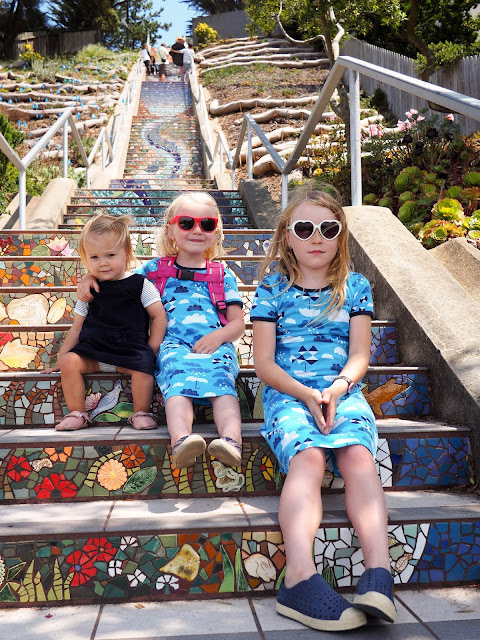 We came across the Hidden Garden Steps while on our way to the more well known 16th Avenue Tiled Steps which are just a few blocks away. At the time I hadn't realized that there were two sets of tiled steps so close to each other and I thought I'd just made a mistake with the address. I felt pretty silly when I realized that we'd come so close to our intended destination without actually making it there! 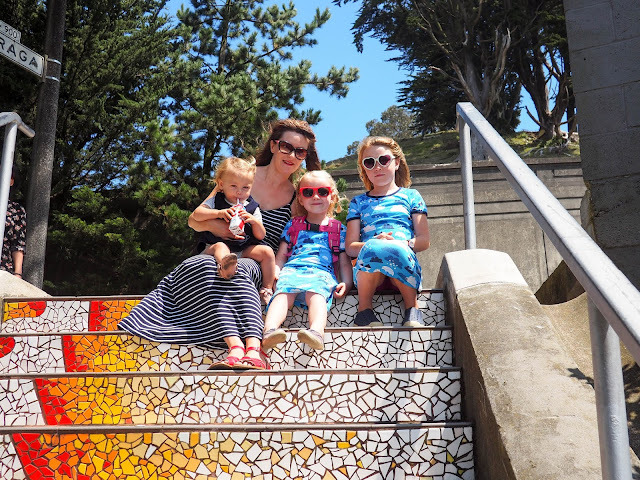 During the Summer vacation the girls and I headed back to San Francisco's Sunset district to go see the famous tiled steps. This time we knew exactly where to go and we knew that there were two staircases. 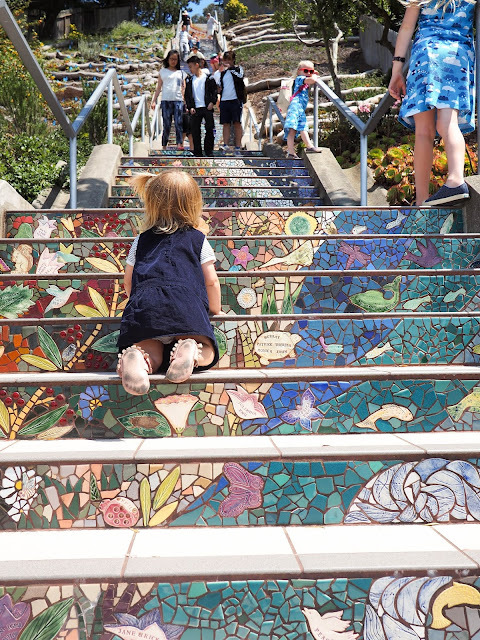 In fact, we made sure to walk via the Hidden Garden Steps to check those out again. Mathilde had been asleep in her baby carrier the first time around and this time she was awake. 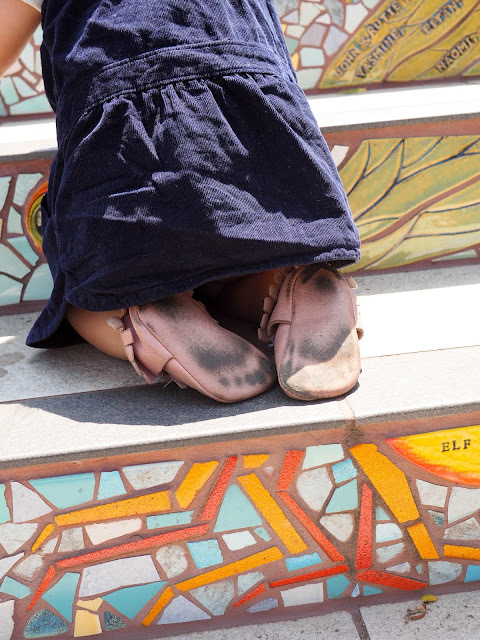 Unlike the Hidden Garden Steps, which no one seems to know about - because, well, they're kind of hidden! 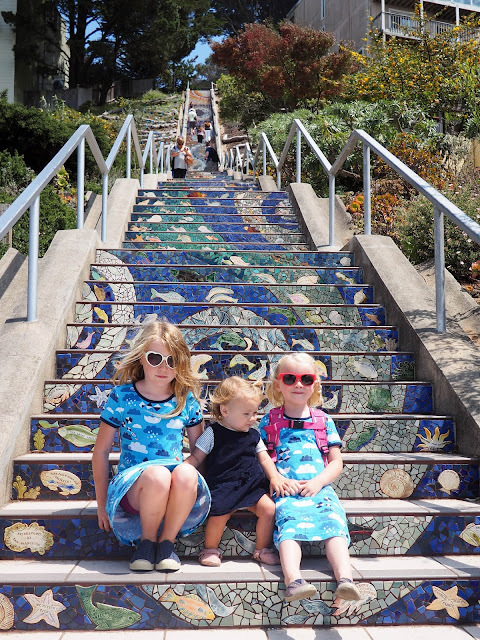 - the 16th Street Tiled Steps are a popular tourist spot. 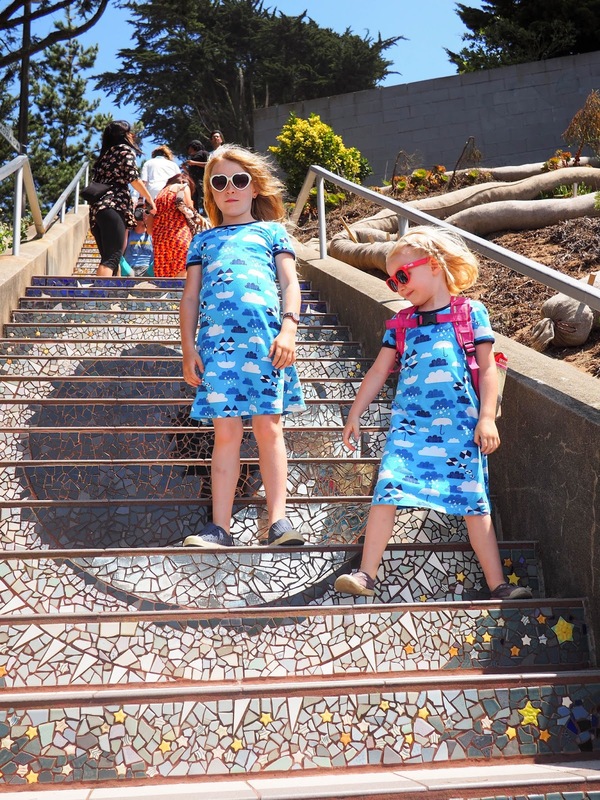 Even on a week day the staircase was full of people taking selfies as they huffed and puffed their way to the top. We stopped for a lot of photos too. Even a few duckface shots! 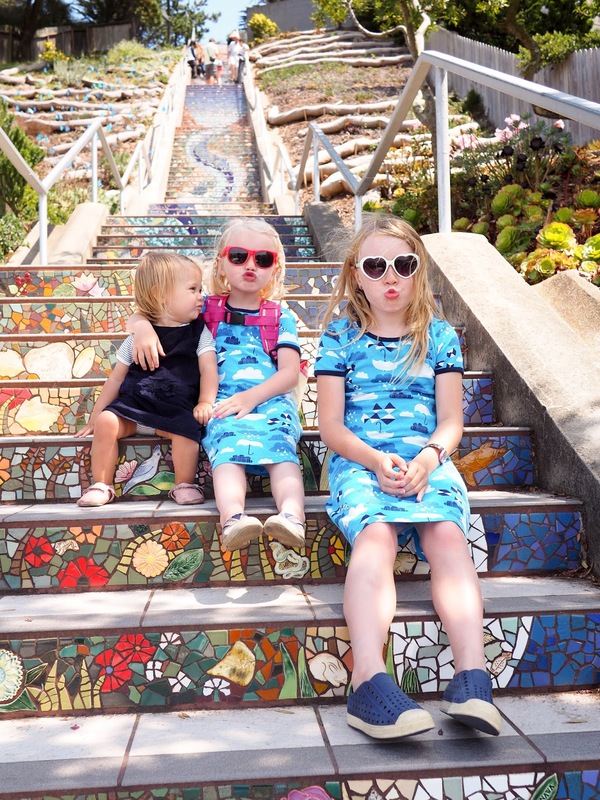 All three of my girls were keen to get to the top of the staircase as quickly as possible. Ava and Lola are pretty competitive and like to race. 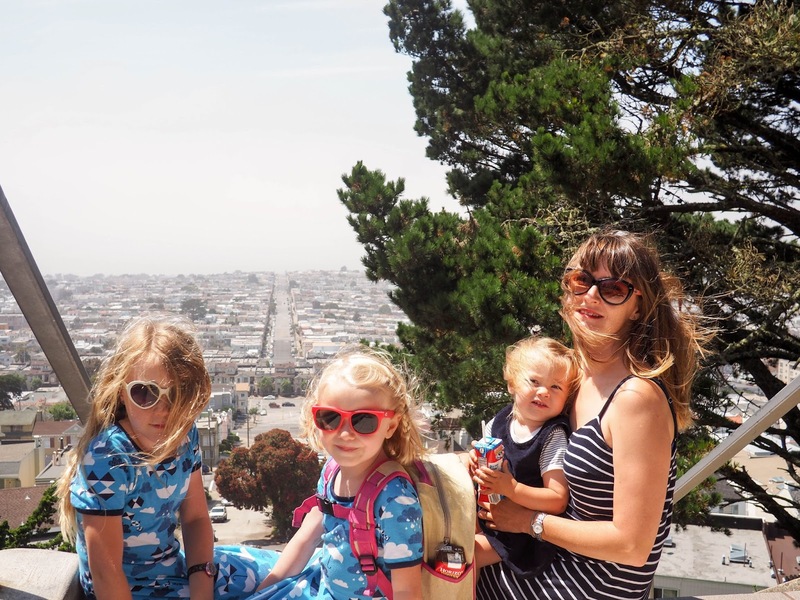 Mathilde likes to copy her big sisters. 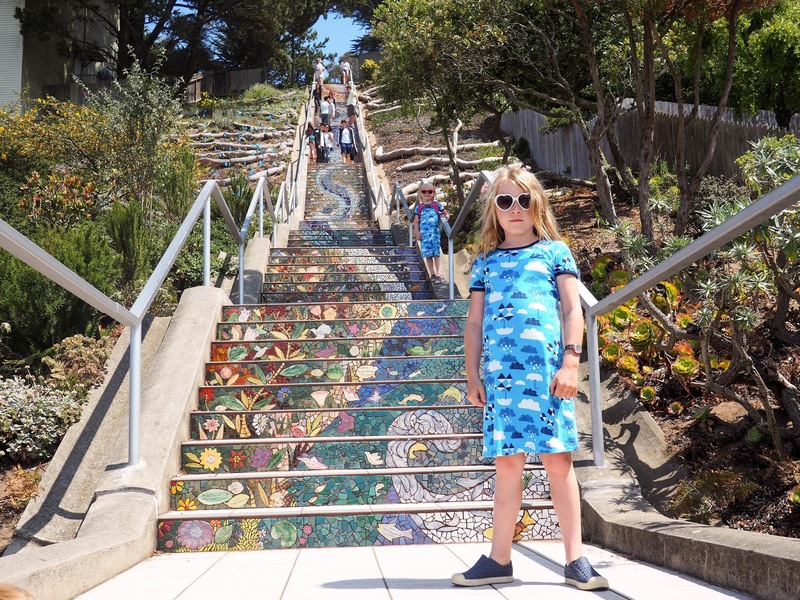 In fact, Mathilde made it all the way to the top of the stairs by herself! 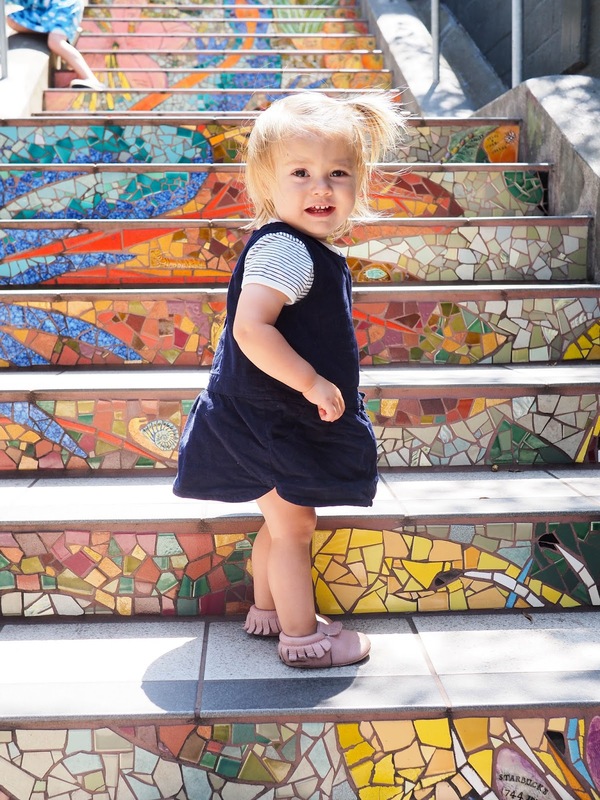 Like many toddlers, she's keen to walk everywhere. 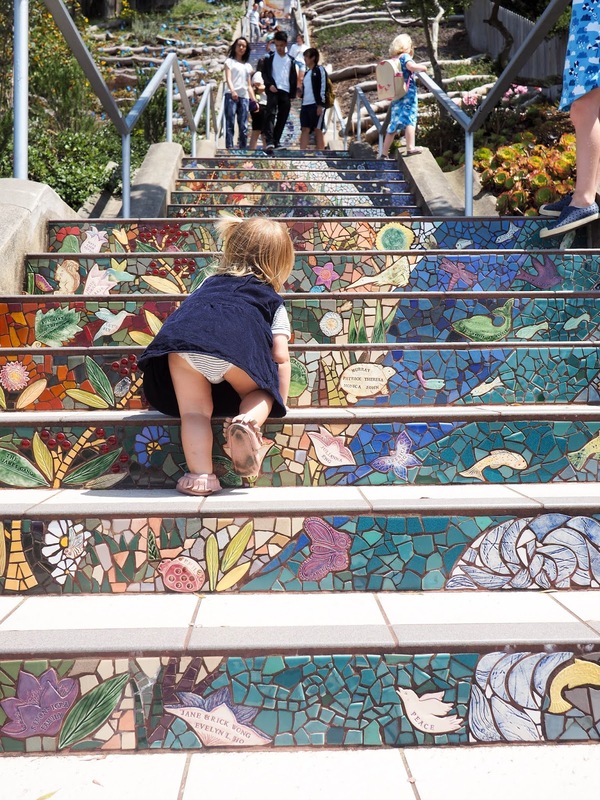 She actually walked the two blocks from the Hidden Garden Steps after climbing those as well. Steps can be a little tricky for toddlers to walk up though, so Mathilde made her way to the top by crawling/climbing. 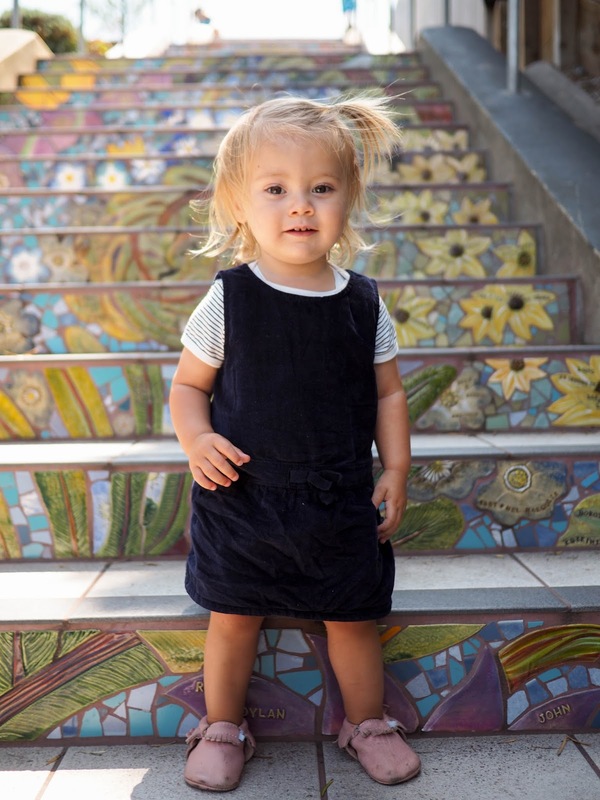 A lot of other people were impressed by her climbing the stairs and stopped to take photos. One woman even got down on her hands and knees and posed next to Mathilde! Somehow I missed getting a photo of that, but trust me, it was pretty weird! The mosaics on the steps are so pretty. The girls liked checking out the details along the way as they climbed to the top. 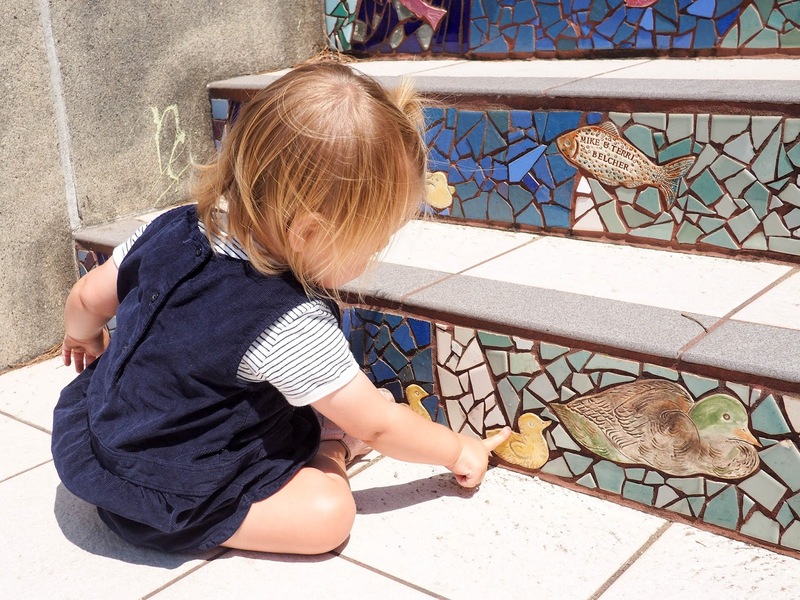 Mathilde was pretty happy to spot a couple of ducks. I love the nature theme and the swirls incorporated into the design. The colors are beautiful, but I also find myself quite fond of the black and white night sky part of the mural. The girls were pretty pleased with themselves when we made it to the top of the 163 step staircase. That's a lot of steps for little legs. We weren't done with the climbing though. See that hill behind us in the photos below? You guessed it, we climbed up that next. 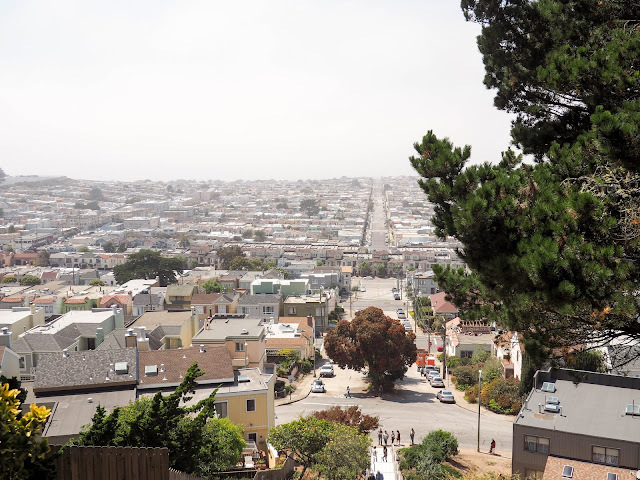 I'll have more photos from Grand View Park at the very top in another post. One thing that always gets me about San Francisco is the fog. I love it. It may have been a beautiful sunny day we were, but a little further down the hill the city had been swallowed by fog. I love the contrast in the sky between the photo above, which faces uphill, and the photo below which faces downhill! Blue sky in one and the city disappearing into white in the other. Remember earlier I mentioned that we also climbed the Hidden Garden Steps on our way to the 16th Avenue Tiled Steps? Well, I've got a few photos from that staircase to share with you too. 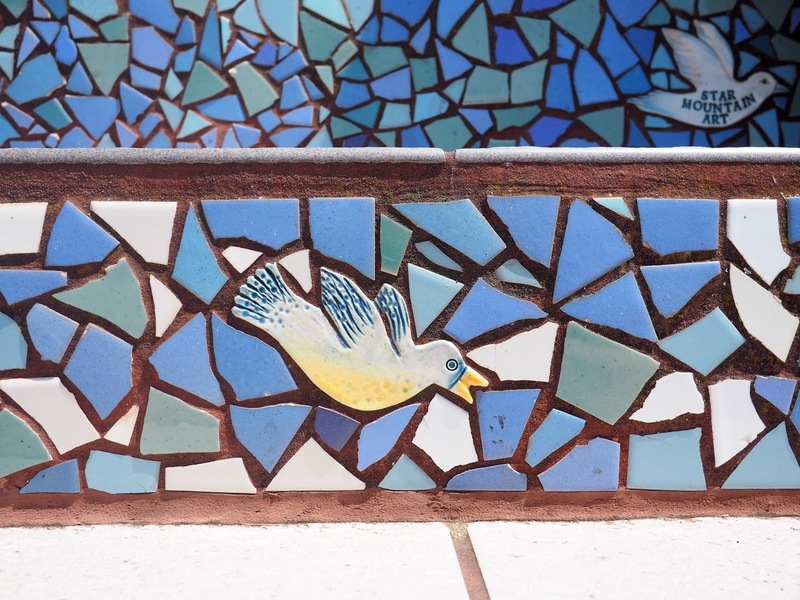 I'm so glad that Mathilde was awake and able to see the mosaics this time. 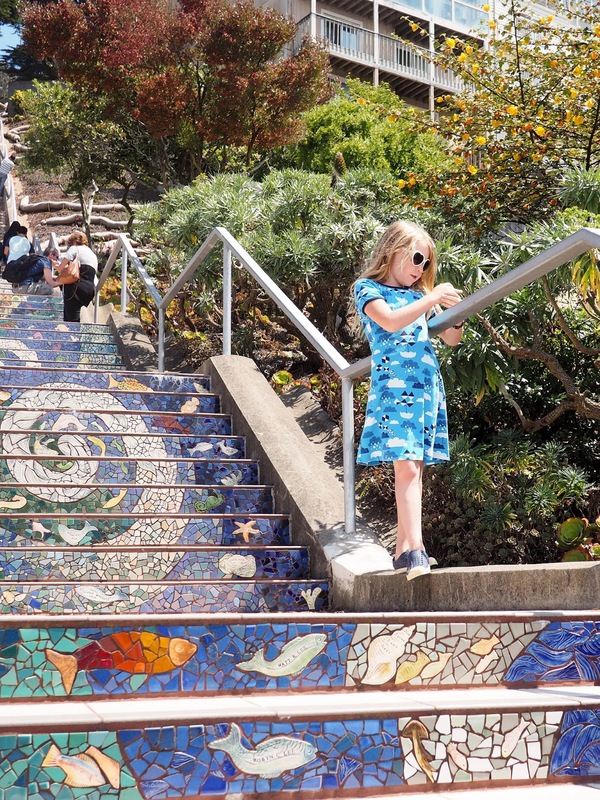 Unlike at the 16th Avenue Tiled Steps, the Hidden Garden Steps were completely deserted. We didn't see another person walk up or down at all. 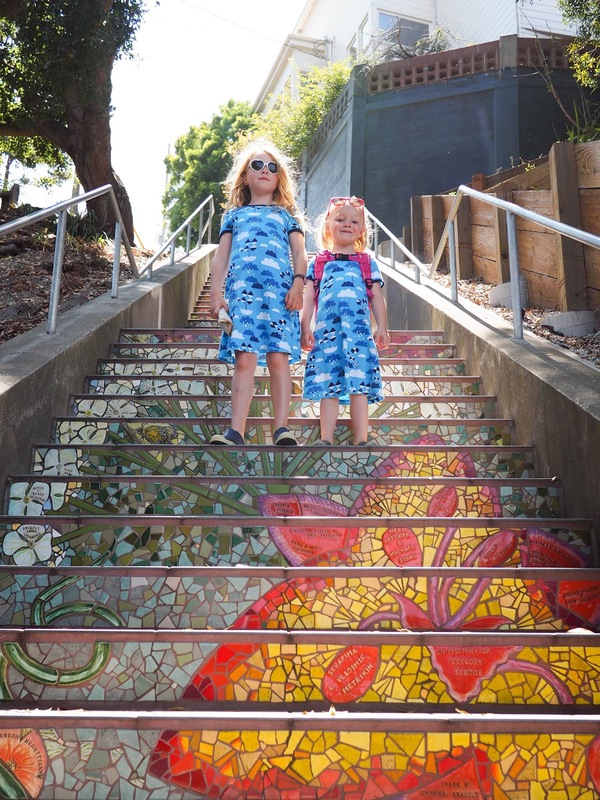 The 16th Avenue Tiled Steps are located on Moraga Street between 15th and 16th Avenues in San Francisco's Sunset Disctrict. The staircase can get a little busy, especially on weekends, but it's definitely worth a look - and a little climb. I recommend first stopping by the Hidden Garden Steps, which are located on 16th Avenue between Kirkham and Lawton Streets, so you can experience both beautiful staircases. We took Muni (N Judah line) and got off at Judah Street and 16th Avenue. From here it is only one block to the bottom of the Hidden Garden Steps. From the top of the Hidden Garden Steps turn right and walk two blocks to Moraga Street and you'll be at the bottom of the 16th Avenue Tiled Steps. When you reach the top it's definitely worth walking that little further to the top of the hill to reach Grand View Park which, as the name suggests, boasts some pretty grand views over the city. 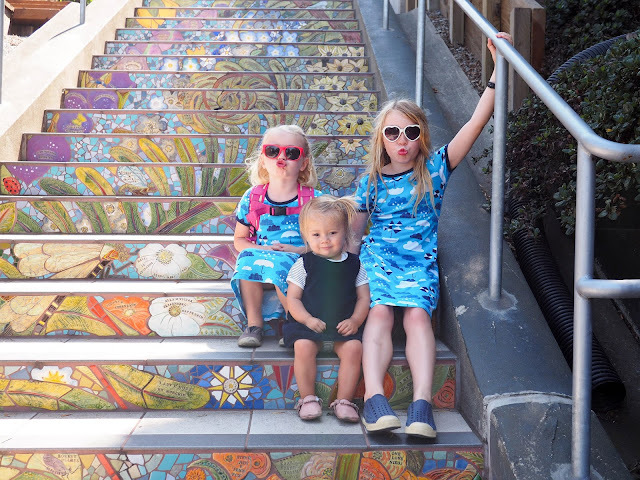 I love finding little treasures like these staircases in San Francisco. I'd love to hear about your favorite spots in San Francisco. Maybe there's another mosaic staircase that we need to go explore! I love this beautiful post! 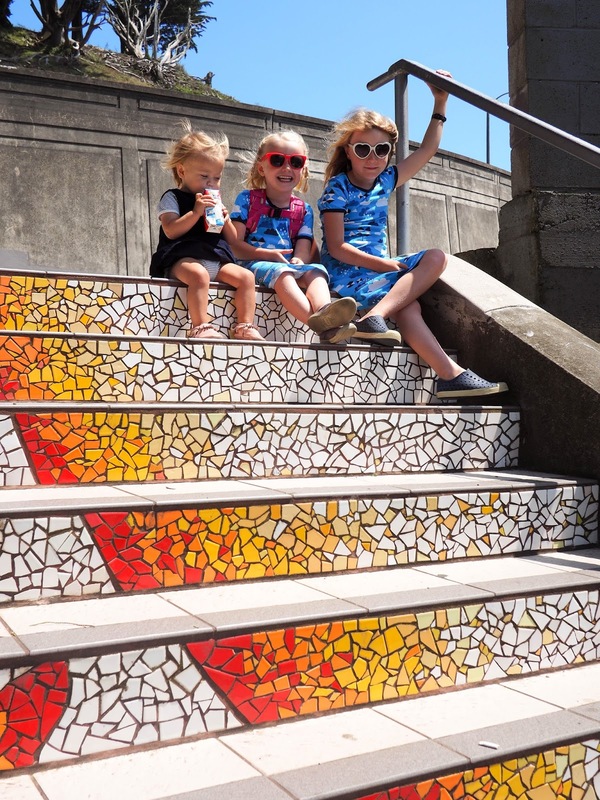 The mosaic steps are great!